This article is about the Victoria suburb. The name may also refer to the City of Greater Dandenong (the Local Government Area within which Dandenong is situated) or the similarly named suburb of Mount Dandenong, Victoria. For the pre-1994 council abolished in favour of Greater Dandenong, see City of Dandenong. For all other uses, see Dandenong (disambiguation). Dandenong CBD skyline (western edge) viewed from the railway station including the ex-Australian Taxation Office tower (tallest office building on the left), "Municipal Hub" (white building) and State Government Offices. Dandenong is a suburb of Melbourne, Victoria, Australia, approximately 30 km south-east from the Melbourne CBD. Situated on the Dandenong Creek, it is 31.6 km from the Dandenong Ranges in eastern Victoria and completely unrelated in both location and nature. It is the main administrative centre for the City of Greater Dandenong local government area. At the 2016 census, central Dandenong had a population of 29,906. It began as a township in 1852 and at the start of the 20th century was an important regional city with its own suburbs. During the mid-20th century it became a major metropolitan manufacturing and commercial area and conurbation of Greater Melbourne. A Business district, the former town centre, covers much of its area and is one of the largest in Greater Melbourne. It is currently undergoing major transit oriented urban renewal, which was first planned in the Melbourne 2030 strategy. Another popular theory is that the name comes from 'bad flour', or 'no good damper'. A local tale revolves around local aboriginals obtaining a bag of lime and mistakenly using it to make damper. An old local hotel was the 'No Good Damper Inn'. A third version has the name Dandenong coming from 'a burning' and 'the past' reflecting bushfires on the Dandenongs. Joseph Hawdon established a pastoral run on Narra Narrawong in 1837, bringing cattle from Sydney by land. Soon a few timber cutters and a police camp were also located there. Dandenong Post Office opened on 1 July 1848. By 1850, the whole area had been taken up for grazing. Dandenong Creek was first bridged in 1840. A road was made from Melbourne, making Dandenong, by the late 1850s, an important staging post for travellers into Gippsland. It became known as the 'gateway to Gippsland'. A township was surveyed in 1852. Milling of the red gum timber became an important industry, and charcoal burning, tanning, quarrying and brick making also flourished. A livestock market was established in 1866. The Western Port Aboriginal Protectorate Station was located north-east of Dandenong from 1840 to 1844. This area had been an important meeting and ceremonial site for Aboriginal tribes. The Native Police Corps established its headquarters there until its disbandment in 1852. The Police Paddocks were then used for breeding and resting police horses. By 1861, there were 40 houses in the township housing 193 people. In 1866, Dandenong Market commenced trading, selling livestock, fruit, dairy products and other farm produce. Dandenong Shire was proclaimed in 1873. The Australian Handbook records the progress of the town by 1875. The Dandenong Town Hall, Lonsdale Street, was built in Free Classical style in 1890 as the combined Shire Hall, Courthouse and Mechanics Institute, at a cost of about 12,000 pounds. The architects were Beswicke and Hutchins and the contractor McCullogh and McAlpine. The two-storey, stucco rendered brick building, on a bluestone base course, features a lofty, Mansard-roofed, corner clock tower and projecting end wings with serlian motif windows and capped by pedimented niches. The post-war industrial boom brought an influx of European migrants, particularly from Italy and Greece. This caused the creation of several suburbs of Dandenong including the public housing estate of Doveton. In the 1950s, Melbourne rapidly expanded south east along the Princes Highway and Dandenong railway line to Dandenong and beyond and it became major metropolitan manufacturing and commercial area as industry extended into the outer suburbs. By the late 1960s, it was officially a suburban area of Melbourne and central Dandenong was transformed by modern buildings, with the redevelopment of the post office to a two-storey modern building in 1960 followed by a three-storey office development for AMP in 1966 and Dandenong Railway Station in 1975. Development in Dandenong had stagnated since the opening of the Dandenong Plaza shopping centre which resulted in the closure of many shops in the central business district. Under the Melbourne 2030 policy, Dandenong was classified as a major activity centre due to its central location with regard to its access to transport. These projects can be considered to be transit-oriented development, where population density is intended to be higher compared to other areas with poorer access to transport. The Greater Dandenong city council has started a programme called Revitalising Central Dandenong, with $290 million proposed to be spent on various projects such as infrastructure upgrades, improved street frontages and public art in order to improve the general amenity of the Dandenong CBD. 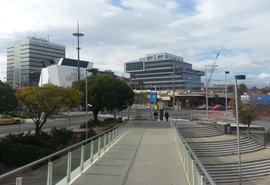 In the longer term, the council wishes to transform Dandenong into a more pedestrian oriented and mixed-use centre. This contrasts with the current situation where the CBD area is primarily occupied by offices and car parking, with a small amount of retail. Dandenong's redevelopment is being overseen by the City of Greater Dandenong council and Places Victoria, a Victorian Government agency responsible for urban renewal. The project is a long-term project, expected to continue for 15 to 20 years. Metro 3175, named after Dandenong's postcode is a major redevelopment of the former Dandenong Livestock Market (established 1866 and closed in 1998) begun in November 2005 consisting of a mixed-use development consisting of 1100 residences as well as cafes and restaurants. Because the site is isolated from the rest of the central Dandenong area, George Street was widened and extended with a bridge across the railway lines to improve access between the precincts. The bridge provides access for cars, pedestrians and cyclists and improves connections to bus services in the area. Additionally, Cheltenham Road, a major east-west arterial has been realigned in order to remove traffic from nearby streets and encourage pedestrian use. Redevelopment of the Dandenong Town Hall (built 1880) into a performing arts centre began in 2004 known as Drum Theatre to a designed by Williams Ross Architects. The centre was redeveloped with a 525-seat proscenium theatre. At the cost of $13 million, the centre was opened by Victorian Premier Steve Bracks on 11 February 2006. The redevelopment involved renovating the existing town hall building and the construction of a modern drum-shaped building. Its striking red colour is prominently visible from nearby streets in the CBD. There was some controversy over fears the redevelopment would destroy the historic facade of the town hall building, but this proved unfounded. In the 2016 Census, there were 29,906 people in Dandenong. The most common ancestries were Afghan 9.9%, Indian 9.3%, English 8.3%, Australian 7.4% and Albanian 4.7%. 28.0% of people were born in Australia. The next most common countries of birth were Afghanistan 11.7%, India 10.5%, Sri Lanka 6.2%, Pakistan 3.5% and China 2.8%. 23.0% of people spoke only English at home. Other languages spoken at home included Hazaraghi 7.9%, Dari 6.4%, Albanian 5.1%, Tamil 4.6% and Punjabi 4.0%. The most common responses for religion were Islam 30.1%, Catholic 13.8% and No Religion 11.6%. Dandenong is situated at the foothill of the Dandenong Ranges on the Dandenong Creek, which flows to the south. The creek forms a green belt with several parks and reserves including Dandenong Park. 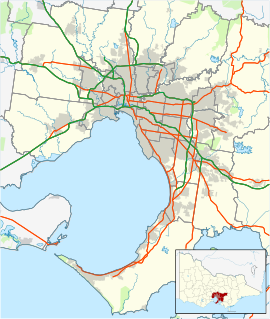 The suburb is bounded by Heatherton Road to the north, Dandenong Creek and Claredon Road to the east, the Pakenham railway line to the south and Eastlink to the west. Dandenong is primarily a private vehicle dependent community due to poorer public transport compared to suburbs closer to the CBD. It is served by the Monash Freeway as well as several other major arterial roads. Eastlink also passes near the suburb. Dandenong railway station is approximately 50 minutes from Melbourne by train, and is situated adjacent to the CBD and is an interchange station for the Pakenham and Cranbourne lines as well as regional trains on the Gippsland railway line. The state government has proposed triplication of the railway line to support a higher volume of trains for the growing population in and around Dandenong as well as other suburbs and towns along the line. The station also serves as a transport hub for the bus network, with almost all bus routes in the area passing through Dandenong station and an interchange on Thomas Street in the CBD. Most buses in the area are operated by Ventura Bus Lines whose depot is located near the railway station. Cycling is facilitated via the Dandenong Creek Trail, part of the off-road cycling network which connects the city trails to nearby Jells Park. In a council planning policy document, Light rail is suggested as a future transport mode for the central Dandenong area. Three state high schools – Lyndale Secondary College and two campuses of Dandenong High School (Dandenong and Cleeland) – and one Catholic high school (St John's Regional College), as well as numerous state and two Catholic primary schools, are located within the suburb's boundaries. Dandenong also contains Emerson School, a specialist school for those with mild intellectual disabilities from a catchment area extending as far north as Rowville. The suburb has several Australian Rules football teams, one is the Dandenong Redlegs (formerly Dandenong Demons/Dandenong West), competing in the Southern Football League at the Dandenong Showgrounds. Other teams in the Dandenong Area include the Dandenong Stingrays (Under 18 TAC Cup - Elite Junior) at Shepley Oval, St John's Old Collegians (VAFA and VWFL - Senior) at Carroll Reserve, and the Dandenong Saints (DDJFL - Junior) at Carroll Reserve. Dandenong hosts three teams in football (soccer). Dandenong Thunder plays in the Victorian Premier League which is the second tier behind the A-League and enjoys much support from the local community. The side plays their home fixtures at George Andrews Reserve has been both premiers and champions of Victoria multiple times The other two teams are Dandenong City Soccer Club and Dandenong Wolves Football Club. who have hosted many international players in its time. These include players such as Ljubo Miličević, Eugene Galeković, Ante Milicic, Cengiz Benlisoy, Semih Yildiz, Cenk Ali, & Ilker Berberoglu. Dandenong also has numerous cricket clubs in the area. Dandenong Cricket Club plays in the Victorian Premier League and has produced a number of state players to date. The most important of these have been Peter Siddle (Australia), Darren Pattinson (England) and Cameron White (Australia) who have all gone on to play test cricket. Other prominent players from the club include Ian Harvey, James Pattinson, Brett Forsyth, Ercan Ileri, Jackson Coleman and Kumar Sana. The area also consists of a women's team, the Dandenong Women's Cricket Club who compete in the Victorian Women's Cricket Association. Several other clubs in the area play in the Dandenong and District Cricket Association (DDCA). These include Buckley Ridges, Dandenong North, Dandenong West, and the St Mary's Cricket Clubs. Other clubs within the City of Greater Dandenong include Coomoora, Keysborough, Lyndale, Parkfield, Silverton, Southern Pirates, Springvale and Springvale South Cricket Clubs. Noble Park Cricket Club is also located within the City of Greater Dandenong, and plays in the Victorian Sub-District Cricket Association. The South Eastern Titans Rugby League club fields both junior & senior teams in the NRL Victoria competition. Their home ground is located at Greaves Reserve. Golfers play at the course of the Forest Hills Golf Club on Wedge Street, Dandenong. 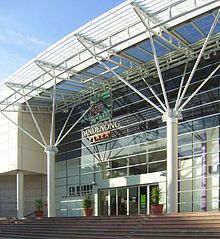 The Dandenong stadium is the home of the Dandenong Rangers (an Australian Women's Basketball League team) and Victoria's state volleyball competition, and from 7 to 12 July played host to the 2008 Australian Junior Volleyball Championships. ^ a b c Australian Bureau of Statistics (27 June 2017). "Dandenong (State Suburb)". 2016 Census QuickStats. Retrieved 3 December 2017. ^ "4.0 What's In A Name?" (PDF). Retrieved 24 August 2007. ^ "RLHP Local Stories: Name Origins of Places In Rowville and Lysterfield". Archived from the original on 17 March 2012. Retrieved 2007-08-24. ^ "Dandenong History". Archived from the original on 27 September 2007. Retrieved 2007-01-09. ^ "Town Hall, Dandenong, VIC Profile:". Archived from the original on 22 September 2007. Retrieved 2007-03-19. ^ Vincent Adams Winter (1990). VR and VicRail: 1962 - 1983. p. 106. ISBN 0-9592069-3-0. ^ Department of Sustainability and Environment (November 2003). "Addendum to Melbourne 2030 Activity Centres and Principal Public Transport Network Plan" (PDF). p. 4. Archived from the original (pdf) on 14 September 2006. Retrieved 2007-01-09. ^ City of Greater Dandenong. "Revitalisation Projects". Archived from the original on 27 September 2007. Retrieved 2007-01-08. ^ City of Greater Dandenong. "Destination Dandenong" (PDF). p. 10. Archived from the original (pdf) on 29 August 2006. Retrieved 2007-01-08. ^ VicUrban. "Who's Involved?". Revitalising Dandenong. Retrieved 8 January 2007. ^ City of Greater Dandenong. "Metro 3175". Archived from the original on 1 November 2006. Retrieved 2007-01-08. ^ VicUrban. "George Street Bridge". Revitalising Dandenong. Retrieved 9 January 2006. ^ "Revitalising Central Dandenong: A Shared Vision" (PDF). 26 April 2006. p. 6. Retrieved 9 January 2007. ^ City of Greater Dandenong. "Town Hall Redevelopment". Archived from the original on 17 January 2006. Retrieved 2007-01-09. ^ Williams Ross Architects. "Dandenong Performing Arts Centre". Archived from the original on 16 September 2007. Retrieved 2007-01-09. ^ Full Point Footy. "Dandenong Demons". Retrieved 21 October 2008. ^ Golf Select. "Forest Hills". Retrieved 11 May 2009. Wikivoyage has a travel guide for Melbourne/Dandenong.